The Learning Resources Pretend & Play Fishing Set is an 11-piece set that comes equipped with a fishing vest, rod & reel, 3 magnetic fish, 3 worms, a net, a 6-page little booklet of fishing-themed activities that can be used with a dry-erase marker (not included) and a tackle box to store everything inside. By children playing together with this fishing set, they learn and develop certain language, social, fine motor and color matching skills. Is the Learning Resources Pretend & Play Fishing Set Worth Buying? One of the biggest things that the Learning Resources Pretend & Play Fishing Set has going for it besides playability is its storability. When finished playing, everything in this set stores in the tackle box. Not only does this feature prevent parts from getting lost, but it keeps the play area less cluttered. This play fishing set can be used both indoors and outside. Some parents use it as a play set in the tub at bath time. Because it doesn’t take up much space, it is great to take along on vacations and amuse a child for hours. One piece that adds realism to the set is the fishing vest. All fisher people wear a vest when fishing! Because it is adjustable, it can be sized to children of different ages and it fits in the tackle box too! The fishing rod reel actually winds the string up once it has been stripped off the reel and a fish “caught” via the embedded magnets. Because the magnets are not exposed, the risk of accidentally swallowing one is minimal, but because the worms used to catch fish are small, a child should be supervised while playing with them, and not under 3 years of age. 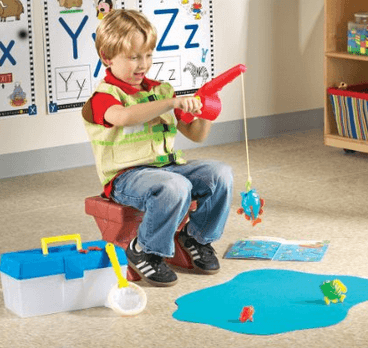 The Learning Resources Pretend & Play Fishing Set allows a child to fish just like Mommy or Daddy. 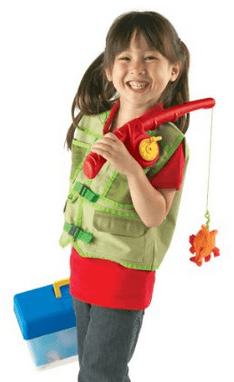 The fishing vest made from plastic, nylon and canvas adds an element of realism and encourages role-playing by baiting the hook with a worm, catching and reeling in a plastic fish. And because everything goes in the tackle box when finished, it also teaches responsibility and organization skills. For the price, this is a durable toy that will provide hours of enjoyment along with learning something.